Wren Woodis, left, as Belky holds Lourdes Carrasco, playing Abuela, during a dress rehearsal Wednesday for Enriques Journey at the Fort Lewis College Theatre Mainstage. Fort Lewis College sophomore psychology major Adam Montoya, left, plays the title character in Enriques Journey while Woodis as Belky watchesduring Wednesdays dress rehearsal. The poetic highlight of Enriques Journey arrives right after intermission. A spare flute solo creates a momentary dream space. Like a quiet memory of home, men and women symbolically work a farmers field. A woman passes among the workers serving the water of life. The scene is beautifully realized and important for what precedes and follows  the harsh truths and brutal realities of immigration today. The Fort Lewis College Department of Theatre has honored author Sonia Nazario by staging a complex yet clear adaptation of Enriques Journey. Nazarios reportage about a Honduran boys struggle to find his mother in the United States won the Pulitzer Prize in 2003. Since then, Nazarios book has garnered many more awards and is taught on college campuses all over the country. This year, Fort Lewis has chosen the book for the colleges Common Reading Experience. Playwright Anthony Garcia said at a dress rehearsal this week that adapting Nazarios massive undertaking was not difficult. The Denver-based playwright began the work last May and has been at the college only a few weeks in residence. Garcia admitted that when he finished the play, he knew it would have to be trimmed. He and Director Felicia Meyer cut the script in half, he said. The piece has had one reading in Silverton and now its first staging in Durango. What makes the adaptation work is Garcias ability to simplify and intensify the story. The play leaps through time by having one character casually mention that four or 10 years have passed. Many theatrical devices are used such as the symbolic field scene or a river crossing, or night escapes, and most important  harrowing train rides. Credit goes to director Meyer for clarifying the relationships from the beginning. 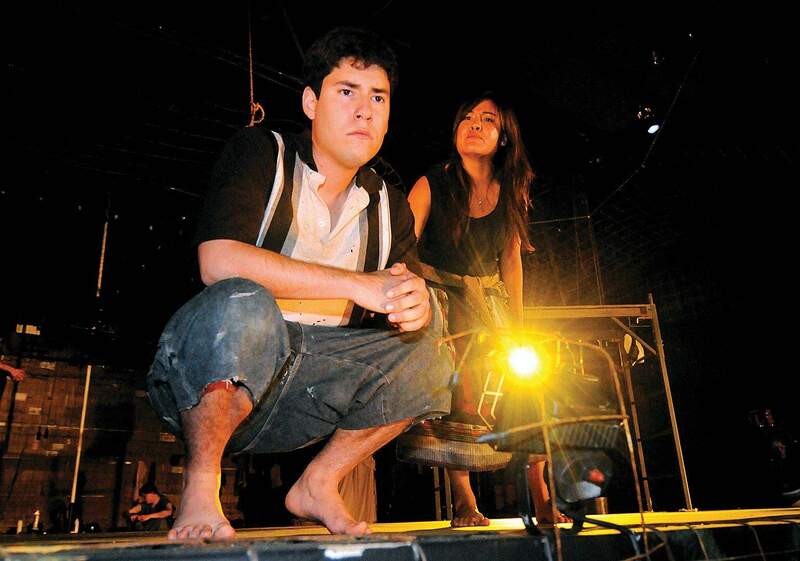 Enrique (played with energy and subtlety by Adam Montoya) inhabits one part of the stage to represent home in Honduras. His mother, Lourdes, (played convincingly with all of a mothers conflicts by Olivia Lopez ) stands opposite, consistently representing life in America. And the complicated drama of Enriques journey takes place center stage and throughout the theater. Credit Set and Lighting Designer Greg Mitchell for a spectacular transformation of the theater into a nightmare of wire netting, concrete walls, cardboard backdrops and remarkable effects that heighten all the dramatic action. Evocative music accompanies the play. Garcias collaborator, composer Daniel Valdez ,contributed three pieces. Music Director Jonathan Latta said he and his four-piece pit orchestra have improvised on that base judiciously adding sound effects to heighten the drama further. And then there is the rumble of the train coming from the sound board. This fully realized workshop production runs about 90 minutes with intermission. 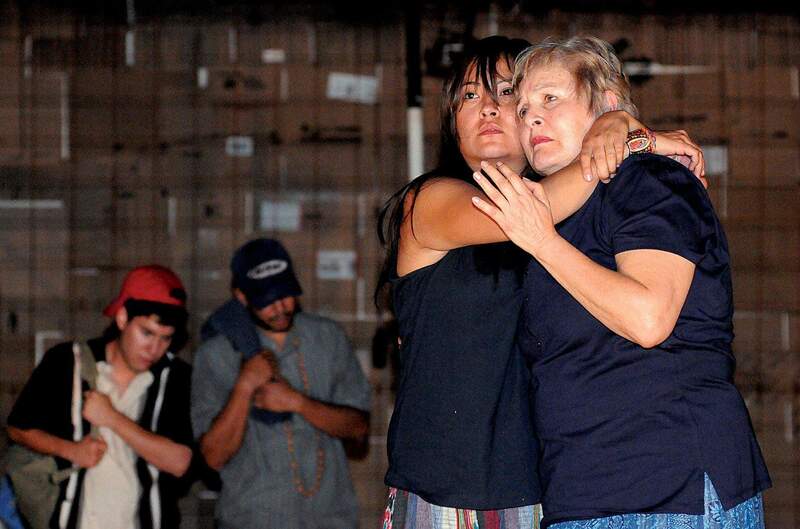 The artwork of Maria Allen-Koerner enhances the experience of Enriques Journey, which is being staged this weekend by the Fort Lewis College Theatre Department. Allen-Koerners paintings, on display in the lobby of the Theatre building throughout September, are symbolic portraits of migrants who Allen-Koerner hopes will inspire the general population to see as real people, with real stories, who just want a better life. Eight of the migrants in the paintings are real people either from this years Common Reading Experience book, Enriques Journey, or have been residents of the Albergue Buen Pastor Shelter in Chiapas, Mexico, founded by Olga Sánchez Martínez. Other portraits represent stories from the Sisters of Mercy. Allen-Koerner will answer questions and sell her artwork after tonights performance of Enriques Journey. One hundred percent of the sale of each painting will be donated to Albergue Buen Pastor, where Sanchez Martinez has cared for and continues to care for hundreds of migrants. Many of these migrants have lost limbs or suffered serious injuries on their difficult train journeys to the north. It is through her efforts that they receive, among other things, antibiotics, pain medication, prosthetics and hope for a better future. It was a Sister of Mercy who sent her a copy of Enriques Journey and it was through this book that she learned the guts of immigration. When she retired, she was searching for a worthy cause to relate to her art. She now lives in St. Louis with her husband and has two step-daughters and two grandchildren. The Fort Lewis College Theatre department presents Enriques Journey, a play by Anthony Garcia based on the book by Sonia Nazario. Directed by Felicia Meyer with original music by Daniel Valdez. Show times are 7 p.m. today, Saturday and Sunday on the Mainstage in the FLC Theatre building. Tickets are $7-$12, available by phone at 247-7657, online at www.durangoconcerts.com or at the downtown box office at Seventh Street and Main Avenue. For more information call 247-7089.